Affiliate Links: If you click a link below, I may receive a credit if you sign up. I pay for these subscriptions. The subscription box love runs deep around here. 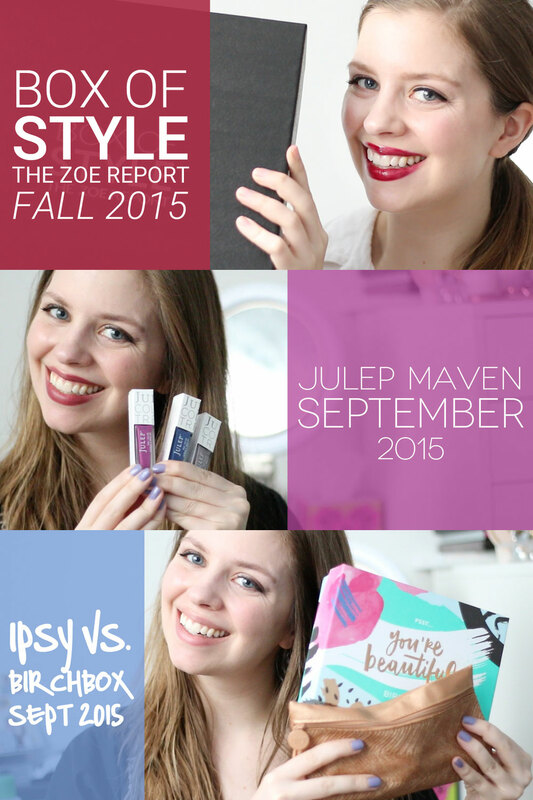 The beginning of the month marked the receipt of my Box of Style from The Zoe Report. Later in the month came the usual suspects: Birchbox and Ipsy. I also received Julep Maven again because… oops, I forgot to cancel. I lucked out again with a box that’s totally usable. Well, this was an oops. I’ve now set an alarm on my phone to remind me to actually go in and select my boxes from here on out. :P Luckily Julep Maven’s style profile is almost consistently on point when it comes to selecting colors for me. The lipstick in Soiree was really the stand out in this box for me, and I can’t wait to use the holographic pink-gray polish in Ellis! The struggle was real between Ipsy and Birchbox this month. I have to admit I wasn’t absolutely in love with either, as there were definite duds in both boxes. The stand outs from both boxes, however, were the NYX Eyeshadow Trio and the Trust Fund Beauty Nail Polish from Ipsy, and the unique Raw Spirit Fragrance and Anastasia Beverly Hills Perfect Brow Pencil from Birchbox. As for which won the battle? The jury’s out, but I think Birchbox may have nudged ahead ever so slightly with the higher quality samples like the Salon Gioje Protein Mask and 100% Pure Eye Cream. That’s a wrap for this month’s subscription boxes. What have you received in your subscription boxes lately? Any new subs out there I should try? I’d love to hear about it! I just ordered my first Box of Style for winter and I am so excited! Everything in the previous boxes sounds like products I will actually get use out of. I love that fedora in the fall box! I had a Birchbox subscription in the past, but I found that I didn’t use any of my products because I didn’t want them to run out – then I just ended up with a pile of unused samples. The only subscription I maintain when I’m home is Wine Awesomeness (and now box of style) because who doesn’t love wine delivered to your door! That fedora is fabulous! I tried the protein mask this past weekend and I wasn’t crazy about the smell but I loved how it felt on my skin! It’s kind of tingly and refreshing and my skin felt really soft and clean afterwards! I had Popsugar for the longest time and then once it expired, I stopped renewing because they just weren’t as good anymore. I felt the same way about Popsugar! The Zoe Report Box is pretty awesome, and they’ve released the “hero” item for the winter box already – a cocktail ring – and it’s super pretty! So glad you got a good Ipsy bag this month, Britt! Thanks Jacquie! I’m also more Team Birchbox, however lately I’ve been feeling a little meh about some of the items I received. Hopefully with the holidays coming they’ll have some better things! Ha, thanks Rita! So happy to hear you like it, and Box of Style is my favorite too. The hat is the best! I got the Julep box back in the day and had to cancell because I had too many polishes. The box of style looks really interesting though!!!! The Box of Style is a great one! Totally feel you on the polish overload, my collection is getting a little out of control! Oooooh. I need to sign up for that Box of Style! Looks like it’s well worth the $100! It definitely is, probably my favorite subscription box ever!